A throwback to a time of style and grandeur, this late Victorian Mance stands on one of Leicester's favourite roads in the sought after and highly regarded suburb of Stoneygate. Requiring some redecoration but having immense charm and character, 5 Holmfield Road,, stands just off London Road behind a mature screen of trees and shrubs. The large entrance hall having high ceilings with decorative plasterwork: deep skirting boards and a grand staircase rising to the first floor creates an extremely impressive welcome and sets the scene for what's to come. There are three reception rooms, all equally as impressive and of a size that is to be expected in a property of this quality and stature. Two of the rooms, both with high, ornate ceilings, grand fireplaces and deep windows overlook the front with the third having French doors set in a deep bay, leading out onto the patio. A rear hallway leads to the huge, extended 26' family, living, breakfast, Cooks fitted kitchen with an Aga, underfloor heating and two sets of double glazed French doors seamlessly extending the room into the private south facing rear garden. A door leads off the kitchen to a lobby which serves as a walk-in larder, with further doors leading to the outside of the property ( formerly the tradesman's entrance) and the cellar, currently used for storage. A cloak room and a downstairs wc off the entrance hall completes the ground floor accommodation. A very impressive staircase leads off the entrance hall onto a half landing with a large window overlooking the side, allowing lots of natural light to flood into the hall and onto the spacious galleried landing above. 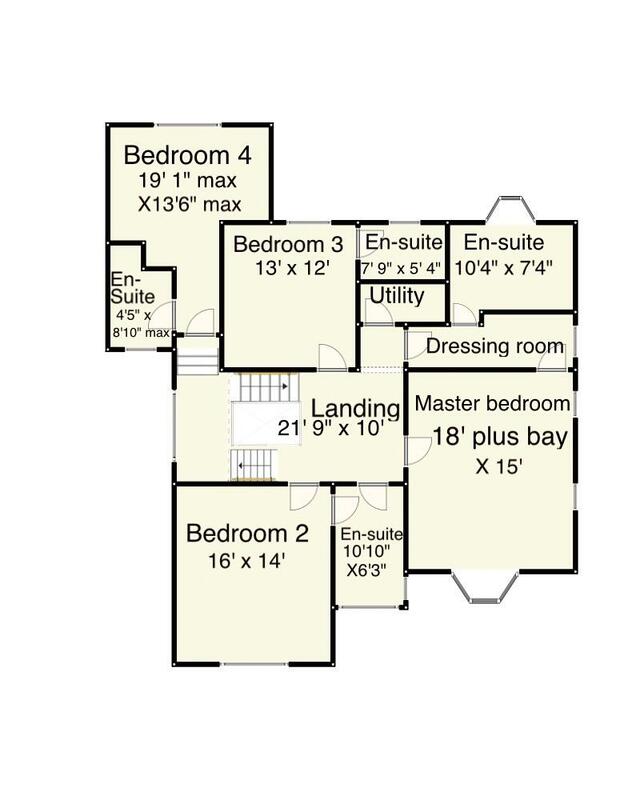 There are four extremely spacious double bedrooms and a utility room leading off the landing. The bedrooms are all of very generous proportions and have their own en-suite bathrooms. The master bedroom is a huge 18' x 15' plus a bay window and having a walk in wardrobe/ dressing area leading into the en-suite bathroom. Access to the vast loft space, which has a dormer window overlooking the front is currently provided by a hatch with a retractable ladder. There is however, subject to the necessary consent, scope to add another staircase and create extra bedroom space if required. Outside the property to the front, the garden is bounded by a low brick wall and screened from the street by mature trees and shrubs. There is a driveway providing car standing and access to the attached brick garage with loft storage space above. The south facing rear garden is a true feature, providing a seamless extension to the house when the glazed doors in the kitchen and dining room are opened up, or a peaceful and very private sanctuary for the family to relax. A patio area runs the full width of the house and round to the side into a gardener's area with a potting shed and pedestrian access to the garage with a very mature and well stocked area beyond. With its name originating from the Old English “ Stone Road”, Stoneygate which was designated a conservation area in 1978 grew in popularity during the late 1800’s as the population of Leicester grew and wealthy professionals and industrialists looked for a settlement close to the city centre. A throwback to a time of style and grandeur, this late Victorian Mance, the former home of one of Britain's best loved authors and playwrights, Sue Townsend, stands on one of Leicester's favourite roads in the sought after and highly regarded suburb of Stoneygate. Requiring some redecoration but having immense charm and character, 5 Holmfield Road, stands just off London Road behind a mature screen of trees and shrubs. Straddling the northern section of London Road which was then and remains today, one of the main arterial routes into the city from the south, Stoneygate is separated from the city on its northern border by 69 acres of parkland known as Victoria Park. Today the park hosts a number of events and activities throughout the year but was until 1883, home to the city’s race course until it relocated approximately 2 miles south to the nearby Leicestershire town of Oadby. In a leafy setting, mainly comprising substantially built late Victorian / early Edwardian homes, the popularity of the area today is largely due to the proximity of the city centre; its business and cultural quarters, hospitals and universities and London Road railway station which is approximately one hour from London St Pancras, home of the Eurostar. The outer ring road lies approximately 2 miles south and leads directly to the M1 and M69 motorways and the Fosse Retail Park..
Birmingham Airport is approximately 40 miles away with the East Midlands Airport being approximately 20 miles. Every House has a story to tell. But perhaps none more so than number 5 Holmfield Road, the former home and creative hub of one of Britain's best- loved authors and playwrights. Sue Townsend bought the former manse in Leicester's leafy Stoneygate more than 30 years ago, moving in with her husband Colin and their family.
" I will always remember looking round the house with Sue, because we couldn't get out of there fast enough," recalls Colin. "The owners were somewhat odd, to say the least." But the house stayed at the forefront of their minds, and when Colin spotted an advert for it in the paper with a different agent 10 days later, he showed it to Sue. "She just rang the estate agent and said I'll buy it. When asked, do you want to view it? Sue said no. And that was that." The two-storey property was the manse of St Margaret’s Church and was the first of its kind in Leicester to be built beyond the city limits. "One of the best things about it was that Sue could get out into the garden in her wheelchair. She loved the garden. Its walled and not at all overlooked, and despite being relatively close to the A6 London Road, it's a peaceful space to sit and relax." The rear reception room, officially the dining room, housed Sue's study where she worked long hours when peace and quiet where essential. But according to Colin, her favourite place to write was at the kitchen table , amid the bustle of family life. We try to make our sales details as accurate and reliable as possible, however, they do not constitute or form part of an offer or any contract and should not be relied upon as statements of representation or fact. None of the services, systems or appliances listed or shown in this specification have been tested by us and no guarantee as to their operating ability or efficiency is given. 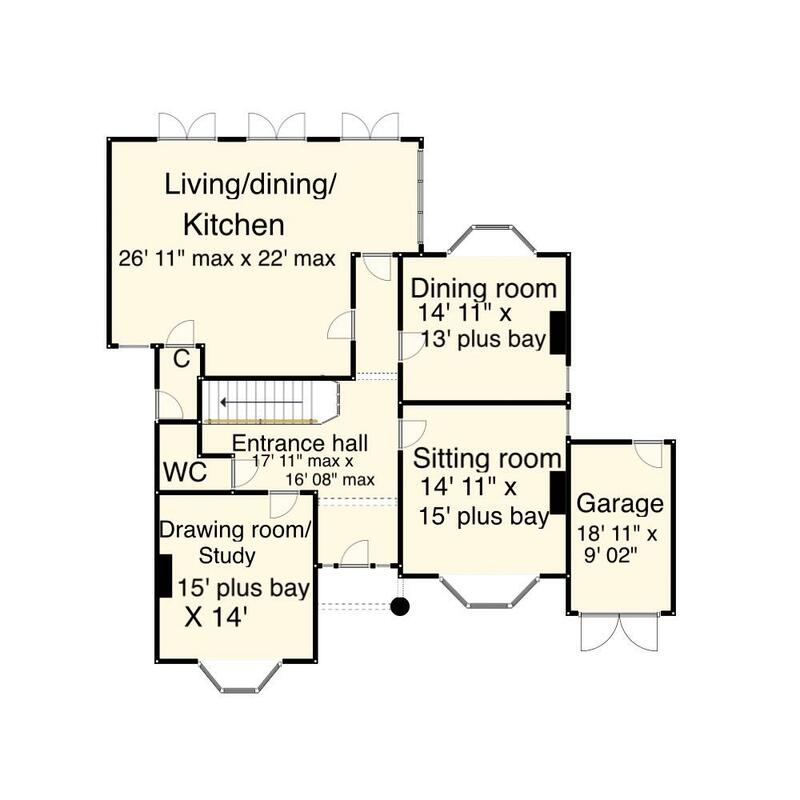 All floorplans and dimensions have been provided as a guide for prospective buyers only, and should not be relied on as a true representation. If you require clarification or further information on any points, please contact us, especially if you are traveling some distance to view. Fixtures and fittings other than those mentioned are to be agreed with the seller.